Domingo Martínez was born in Seville in the last third of the 17th century, probably around 1688 given that the Conde de Águila stated that he died at the age of 61 in 1749. 1 Martínez first trained in Seville with Alonso Miguel de Tobar (1678-1758), the almost unknown Juan Antonio Ossorio, and Lucas Valdés (1661-1725). However, he can stylistically be considered an almost direct heir of Bartolomé Esteban Murillo (1617-1682), making him the most important and highly prized painter in Seville in the first half of the 18th century. Martínez’s capacity for work soon led him to open a studio in his house. Juan de Espinal, Andrés Rubira and Pedro de Tortolero were among the numerous pupils that studied with him. According to Ceán Bermúdez, some studied “principles, others copied prints, the former drew plaster casts and figure models while the latter drew from the life.” 2 These pupils thus followed modern teaching precepts in which draughtsmanship was the basis for acquiring the art of painting. As noted above, Martínez’s principal tool in teaching painting was the constant practice of drawing, be it copying prints, casts or life drawing. He not only applied this principle to his pupils but was also an extremely prolific draughtsman himself, although according to Ceán Bermúdez, “his drawing was not very correct.” 4 Various academic nudes by the artist have survived, of which possibly the most important was the group in the Brauer Collection in Zurich, published by Pérez Sánchez. 5 It comprised forty-four drawings, formerly attributed to Murillo but which Pérez Sánchez identified as by the hand of Martínez. The group included seventeen life studies, many depicting the same youth in various poses: standing, imitating poses of classical sculptures, kneeling, reclining, lying down, etc. Made with the sole aim of perfecting the artist’s technique, none of them are preparatory studies for paintings. The present academic study was in the Brauer Collection. 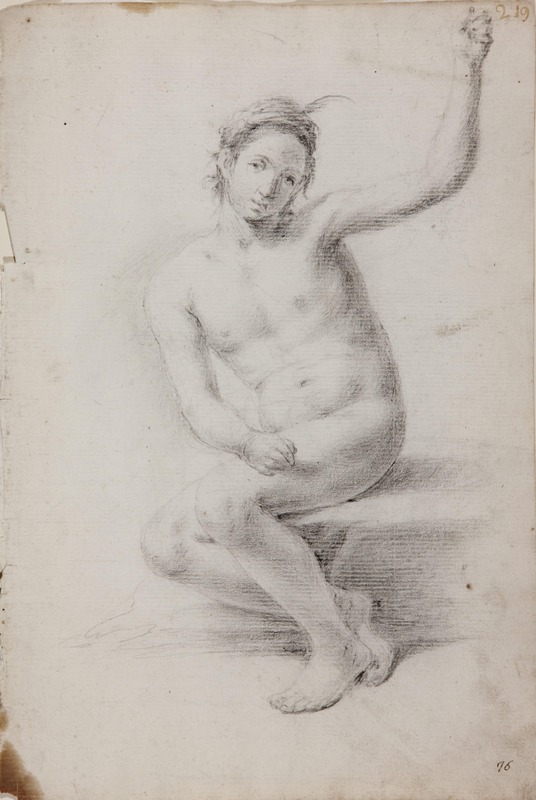 6 It depicts a youth seated on a step with his arms raised in an unnatural pose. To maintain poses of this type for hours the models would hold on to ropes or structures that allowed them to remain still. Such practice follows the advice of José García Hidalgo, whose treatise Principios para estudiar el nobilísimo arte de la pintura (Madrid, 1693) includes a print of a posing model comparable to the present drawing, surrounded in the case of the print by students drawing the figure from different angles and viewpoints, advised by the master. Anatomically, the present drawing is not entirely correct. The torso, arms and legs are incompletely defined, a fact that justifies the Ceán Bermúdez’s opinion referred to above regarding Domingo Martínez’s drawings. Nonetheless, this sketch is characterised by its delicacy, gentleness and tenderness. The restrained contrasts of light and shade and above all the boy’s tender gaze, as he looks directly at the viewer, give the present figure life and make this drawing far more than a standard academic study. Martínez imbues this normally formal genre with sentiment, revealing an ability to breathe life into his works that locates himself firmly within the tradition of Murillo. Soro Cañas, Salud, Domingo Martínez, Seville, Arte Hispalense, 1982, p. 17. Ceán Bermúdez, J. Agustín, Diccionario Histórico de los más ilustres profesores de las Bellas Artes en España. Madrid, en la imprenta de la viuda de Ibarra, 1800, vol. III, p. 74. Soro Cañas, Salud, Domingo Martínez, Seville, Arte Hispalense, 1982, p.20. Pérez Sánchez, Alfonso E., “Dibujos de Domingo Martínez” in Domingo Martínez en la estela de Murillo. Exhibition catalogue, Seville, Centro Cultural El Monte, 2004, pp. 41-55; and Domingo Martínez en la estela de Murillo. Exhibition catalogue, Seville, Centro Cultural El Monte, 2004, pp. 301-309. The drawing is published in Domingo Martínez en la estela de Murillo. Exhibition catalogue, Seville, Centro Cultural El Monte, 2004, p. 307, fig. 141.